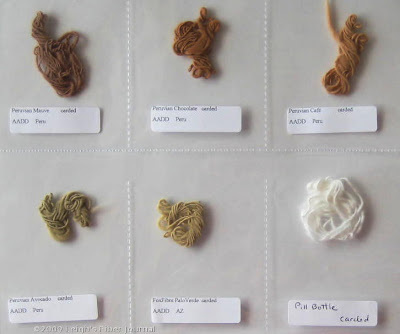 Leigh's Fiber Journal: My Weekend: "Cotton & the Charkha"
Fiber Forum was fantastic. It was the first time I'd ever been to an actual fiber conference, and as you can imagine I enjoyed every minute of it. Unfortunately, I didn't get any photos, so you'll have to put up with a pretty much pictureless description of my weekend. That's my cute little mini-center-pull ball on the bottom. We also got to spin a variety of cottons, from the 31 samples in the notebook we received in class. Below are the ones I chose to try. You can click on this one to biggify a bit. Of course, these are freshly spun and the twist is not set, but it did give me an opportunity to feel how differently they spun. Eileen does a lot of weaving with her handspun cotton, mostly as weft from singles. Working with Bluster Bay, she has developed a clever boat shuttle that holds charkha spindles for weaving without winding! Very nifty. As you can well imagine, a book charkha has been added to the top of my wish list, especially considering my cotton stash enhancement last year. And if I forget what I learned by then, I can get Eileen's DVD. Fortunately, she's a member of my guild, so anything I might need will be handy to get indeed! Wow, sounds like a really great class. Good job and you certainly have a whole heap of cotton to spin. Looks like a lot of spinning goodness in the future. I once had a book charkha and never got the hang of it. Boy, I wish I could have taken a class like you did. So glad you had a great time and learned so much. What a great time! I have always been fascinated by charkhas but afraid to try because of the left-handed thing you mentioned. So is your mind buzzing with new ideas? Very very interesting! I did not know that much about cottons. It sounds like a great time! I love the coloured cotton varieties - unfortunately they are not so easy to get over here! and I find the colour change with boiling rather inspiring - even though I spin with the normal wheel, no charkha. 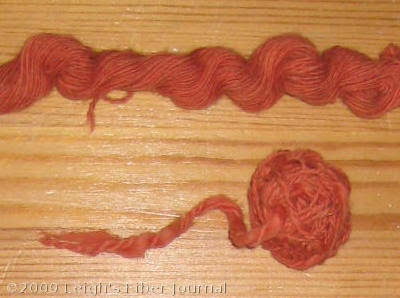 the spindolyn works pretty well, too, with cotton! Barb, I wouldn't have been able to figure this out without a class either. Too bad you don't have your charkha any more. Patrick, I've very motivated! Eileen's method of learning the left-handed long draw was pretty easy. We did it in two steps. We would draw out a couple of inches with the left hand, stop, then turn the charkha wheel a quarter turn, repeat. By the end of the weekend I was able to do both at once. Bettina, from what I understand those colored cottons are going to be harder to get everywhere. Sally Fox isn't growing as many types any more, and no one else is doing it on any large scale. I live in a cotton growing region, but the commercial cotton industry has managed to get laws passed making it illegal for anyone to grow any other type of cotton (than what they sell) within so many miles of existing commercial cotton fields. And they will prosecute. The supposed reason for this is to avoid cross-pollination. However this is rare as cotton is self-pollinating. The color changing of cotton is fascinating, isn't it. We learned that either boiling or a high pH will produce the same effect. Its sounds like you had a real good time and what a fun class! I took a 2-hour workshop with her at SAFF a few years ago. Spinning on the charka was interesting and I did get to the point where I knew I could work on learning how to spin it at home. But it just wasn't me. I can see, however, that a long workshop would be just perfect for learning this skill. The class sounds amazing, what fun to use such a portable spinning wheel - Ghandi was really on to something there! Sounds like a wonderful time, and sounds like you learned a lot! So sad to hear that no one is growing the cotton. How quickly things become lost to us. I'm running into the same problem with the flax. No one is growing it. Lots and lots of flax for consumption (In the USA)...but I have only found one variety to be available for textile (and it is the same one I grew last year). And this is "The year of Natural Fibers!" How can we change this? You would think we could get a permit or something. cotton is fun isn't it?